First, make sure you have an account with Amazon Web Services. Then download and install pywren via PIP as outlined in the getting started materials Then enjoy running your code on thousands of cores simultaneously! The overall goal is to mimic the Python 3.x futures interface as much as make sense. non-trivial function invocation overhead, sometimes 15 sec! 2017-03-27 PyWren 0.2 - Annoucing PyWren 0.2, bugfix release and interactive setup script. 2017-03-06 PyWren 0.1 - Annoucing PyWren 0.1, with Python 3 support, large-scale reducers, better logging, support for running on arbitray instances, and a new website! 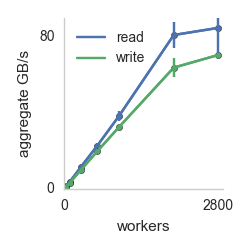 2016-10-27 Microservices and Terabits - Using Pywren to benchmark S3, we achieve over 80 GB/sec of read performance and 60 GB/sec of write performance using Amazon S3. 2016-10-25 Microservices and Teraflops - Can AWS Lambda be used for scientific computing ? 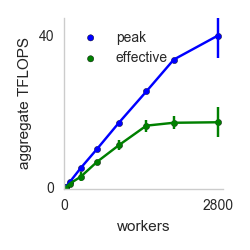 Here we use a new platform, pywren, to achieve over 25 TFLOPS using pure python across thousands of simultaneous workers.